When applying for a nonimmigrant visa, you are required to upload a digital photograph taken within the last six months as part of completing and submitting the Form DS-160. You should also bring a copy of your photograph to the U.S. Embassy or Consulate on the day of your interview. You will also be fingerprinted when you arrive for your interview at the U.S. Embassy or Consulate. Your visa application photo must meet certain criteria regarding size and content. Submitting photos that do not meet these criteria can delay the visa application process. To reflect your current appearance, your photo must be taken within the last six months. 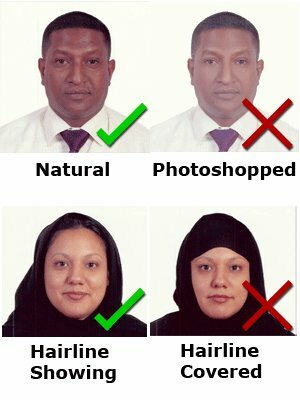 If you are renewing a previous visa, this generally means your photo must not be the same one that appeared on your old visa. If your photo does not meet the requirements, you will be required to submit a new photo before your visa is processed, even if the visa application system accepted it as a digital photo upload. *Starting November 1 2016, applicants are not permitted to wear eyeglasses in photos. 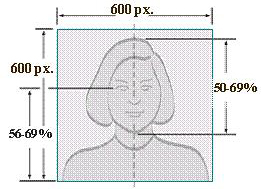 Your head height, measured from the top of your head, including the hair, to the bottom of your chin, must be between 50% and 70% of the photo's total height. Your eye height, measured from the bottom of the photo to the level of your eyes, should be between 55% and 70% - or roughly 2/3 - of the photo's height. Your photo must be square-shaped, meaning the photo's height must be the same as its width. The minimum dimensions for your photo are 600 pixels x 600 pixels (height x width). The maximum dimensions are 1200 pixels x 1200 pixels (height x width). Head orientation is important when taking your visa photo. Frame yourself within the photo so that your full face shows. Face directly toward the camera and make sure your eyes are open. Center your head within the frame. Do not wear glasses in your photo and make sure your eyes are open. Your eyes should be 2/3 of the way up the photo, or between 1-1/8 inches to 1-3/8 inches (28 mm and 35 mm) - about 60% - from the bottom of the photo. Eyeglasses: Starting November 1, 2016, eye glasses will no longer be allowed in visa photos. For further details on photo requirements please visit https://travel.state.gov/content/travel/en/us-visas/visa-information-resources/photos.html. The area behind you in the photo should be uncluttered and either white or off-white. Sit in front of a plain white or off-white background for best results. Sit so that your face is fully-lit and there are no distracting shadows across your face or in the background. Do not wear a hat or head covering that obscures the hair or hairline, unless worn daily for a religious purpose. Your full face must be visible, and the head covering must not cast any shadows on your face. Glasses may not be worn in visa photos. For more information about visa application photo specifications, visit the Department of State's website. The Department of State also has a photo FAQ (Frequently Asked Questions) here.